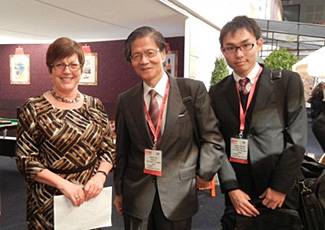 At the same time, ICA also organized the third global fair for the co-operative movement, ICA Expo 2012. Expo Co-op 2012 brought co-operative enterprises from over 45 countries with 200 exhibitors. The total number of visitors reached 10,000 people. They visited the booths and attended meetings and workshops that were held at the event. 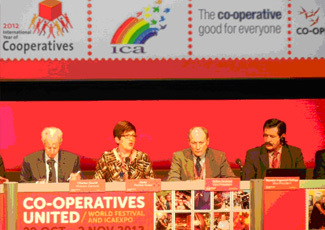 The main subject of discussion in the Assembly was the ‘Blueprint for the Co-operative Decade’, which will turn the International Year of Cooperatives into a decade of co-operation. At the symposium, speakers from Co-operatives UK (UK), Mondragon Corporation (Spain) and Desjardins (Canada, a co-operative financial group) presented about how co-operatives contributed to the economic development and contributed to the society through creating employment. The relationship among co-operatives becomes stronger with the 2012 International Year of Co-operatives. NFUCA also shares the spirits of cooperation and working together to spread the values and principles of co-operative.